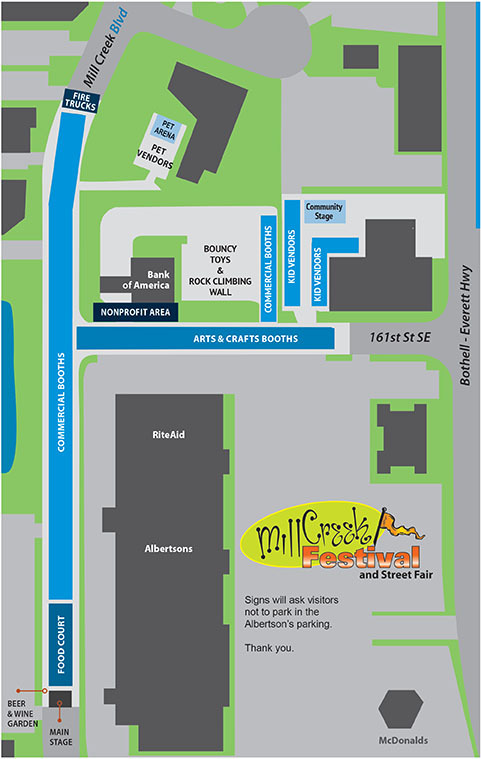 Mill Creek Festival map. Image courtesy of Mill Creek Business Association. Written based on City of Mill Creek press releases. The City of Mill Creek and Mill Creek Festival organizers want everyone to be aware that roads will be closed making traffic and parking difficult this weekend. They would like Mill Creek Festival goers to use the free shuttle. Mill Creek Boulevard will be closed between 164th Street SE and 161st Street SE. Mill Creek Boulevard will have an additional road closure, from 164th Street SE to 159th Place SE. 161st Street SE will be closed to thru traffic between Mill Creek Boulevard and the east entrance to Mill Creek Plaza (Rite-Aid, Albertsons parking lot). These closures will be in place for the duration of the Mill Creek Festival, concluding Sunday, July 15th, at approximately 11:30 PM. Motorists should expect delays throughout Mill Creek so please plan accordingly. Shuttle buses will be available to festival attendees between Jackson High School and the Festival site. Saturday from 7:00 am to 8:00 pm. Sunday from 10:00 am to 7:00 pm. “No festival parking, free shuttle at Jackson High School” signs will be placed at the entries into Zen Garden’s, QFC’s, and Albertsons’ parking lots. Signs at each major intersection will direct festival parking to Jackson High School. There will be two shuttles running a non-stop loop between the Festival and Jackson High School. The shuttle pick-up will be at the Jackson High tennis courts and will proceed through Heatherwood Middle school. The drop-off will be in the Post Office turn-around. Signs will mark the pick-up and drop-off areas. There will be Festival Programs located at the shuttle sites and volunteers will be placed at the shuttle sites to welcome people to the Festival and answer questions.